Press Tv exclusive interneiw with Phil Wilayto. Phil is an organizer and writer based in Richmond, Virginia, USA, where he is a co-founder of the community organization Defenders for Freedom, Justice & Equality and the editor of the quarterly newspaper The Virginia Defender. A civilian organizer in the Vietnam War GI Movement, he is a founding member of the Virginia Anti-War Network and the Virginia People's Assembly and a member of the Continuations Body of the National Assembly to End the Iraq and Afghanistan Wars and Occupations. Our resistance is against oppression and the oppressors. We promise to protect the oppressed and innocent humans till the last drop of our blood. The 4th episode and most heartfelt story so far in our series on the Defenders of the Holy Shrines and their families. This one is not just about being the wife of a shaheed, but about being the child of one. A touching Nasheed by the defenders of the dignity of Islam - Ayatollah Shaykh Isa Qasem in Bahrain. The despotic al-Khalifa regime will face serious consequences. Shaykh Ali Salman expresses the sentiments of the Bahraini masses. A tribute to all the martyr\'s of Islam, especially the defenders of the Holy Shrines. Al-Hashd al-Shabi defeated ISIS in Iraq and freed up the illegally occupied land of Iraq. This eulogy is a tribute to these brave men - the defenders of honor and dignity. 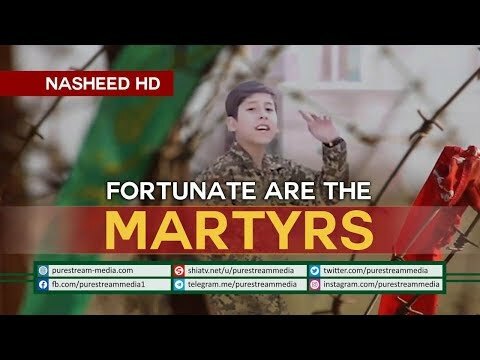 A beautiful nasheed where young kids express their love for the household of Prophet Muhammad (S) and vow to defend the shrines of Ahl al-Bayt (A). Shiatv.net was launched on 15 Shaaban 1428 AH. Felicitations on the birthday of our Master Imam Al-Qaim Imam Al-Hujjah Baqiyatullah Mahdi Akhiruz Zaman(a.s) and Third Anniversary of Shiatv.net in year 1431 and 2010. This video also features an original sound track by Defenders of Justice (DOJ), an upcoming group with beautiful Nasheed Album, soon to be launched. Full documentary video in Persian about Iranian military service in the Islamic Republic. Downscaled. 2011: Millions Iranians yearly march during the Islamic Revolution day. The Western media denies the Western viewer all of this footage, and this year attempted to overshadow millions of Iranians marching for their government by using Egypt as a tool.